Western Illinois Builders Association, WIBA, is an association of individuals and firms who have joined forces, voluntarily, to promote all phases of the building and remodeling industry. "Support Your Local Communities, Where Professionals Do Professional Work"
Through the years, Mel Foster Co. has provided leadership and integrity to the regional real estate profession. Mel Foster Co. was founded in 1921 when, at the age of 21, Mel Foster, Sr. opened a one-man, one-room real estate operation. The company built its first house on Telegraph Road in 1927, the beginning of thousands to be built in the area. By 1936, there were offices in Moline, Rock Island and Davenport, plus a full service insurance division. Mel Foster, Sr. believed that it was important to provide affordable housing and that industry would locate where housing was readily available. The company successfully negotiated major industrial site purchases in the Quad Cities, including International Harvester, Caterpillar, 3-M, Cordova Nuclear Power Plant and ALCOA. At the same time, the company developed subdivisions, built houses, and advocated for annexation, becoming a key ingredient in the physical and economic development of the Quad Cities and surrounding areas. Under the direction of Mel Foster, Jr., the company continued its tradition of leadership, including negotiations for major industrial sites such as John Deere Davenport Works, the development of prime office space, major downtown and suburban developments. A pioneer in regional residential developments, the company has continued innovations with numerous large scale subdivisions. 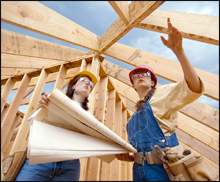 Mel Foster Co. is committed to quality in construction and development. Today, under the management of a team of professionals, the company continues to be a leader in the brokerage division in the Iowa and Illinois area. Mel Foster Co.’s comprehensive services set the standard for excellence and leadership in the industry. I have a Galesburg Contractor's License GC14-199. I am registered with FEMA in the following cities; East Peoria and Washington for tornado damage.